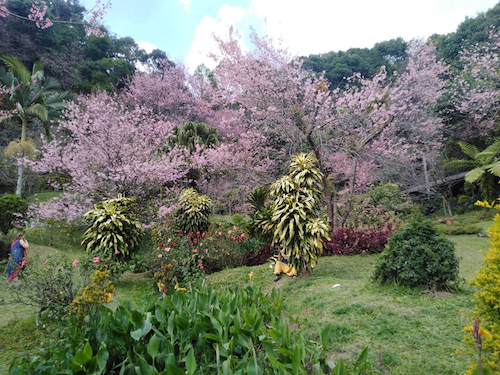 This Sunday we have our annual pilgrimage to see the Sakura or Wild Himalayan Cherry (Prunus cerasoides) blossom at Ban Hmong Khun Chang Khian and the University’s agricultural research gardens nearby, near the top of Doi Pui. This hike has three variations, and we need participants to decide before the start if they are going to choose the first one, in which case to put down money (THB 200) for the return songthaew (red truck) transport. 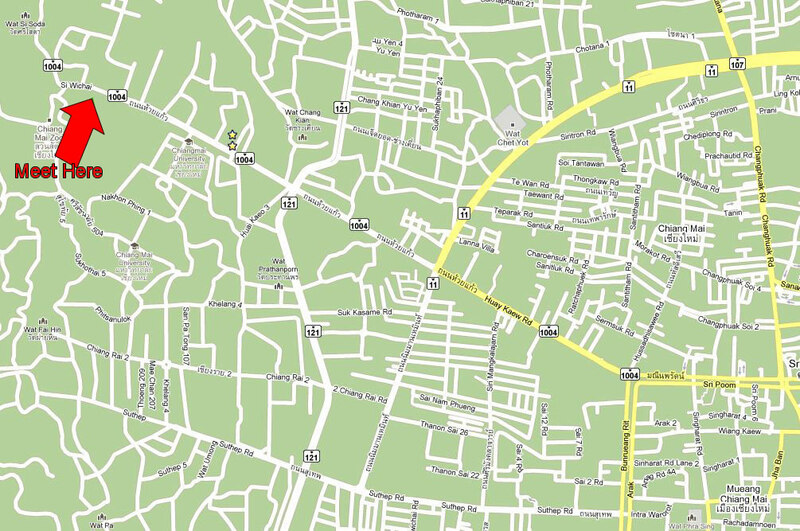 In all three variations, we take car and/or songthaew transport from the meeting place (the Arboretum car-park on Huay Gaew Road, near the zoo) to the carpark/restaurant area at the foot of the steps of Wat Doi Suthep. From there we hike to the sakura area, which takes about three hours. Once there, hikers may disperse for up to an hour to enjoy life at leisure. The (temporary) food stalls and some of the best blossoms are to be found at the Agriculture Research Station about half a kilometer to the west of Ban Hmong Khun Chang Khian village, and it is this location that provides good views of the sakura trees. This area will be very popular! We therefore advise everyone to bring sandwiches, snacks and drink as a contingency. Also bring something warm to wear. Variation 1 is to take a songthaew from the sakura area back to the Arboretum (via Wat Doi Suthep). We will need to book the songthaew in advance, which is why we need to know how many people will take this option. Cost depends on number of passengers in vehicle, but in past years, people have received some money back from their THB 200 deposits. We would meet the songthaew at 1pm, and arrive back at the Arboretum about 2.30pm. Variation 2 is simply to hike back along the path from the sakura area to the Wat Doi Suthep carpark area (10km in about two-and-a-half hours), from where you can catch a public songthaew (THB 40) or ride in shared car back to the Arboretum, arriving about 4pm. Variation 3 is a relatively strenuous hike from the village all the way to the Arboretum. It is only 8km horizontally, but 1km vertically. The continuous fairly steep descent makes it tiring. Return to the Arboretum may be after 4pm. Meet at 07:45 in the car park of the Huay Kaeow Arboretum (also known as the exercise park). Head straight out from the moat 3.5 km towards Doi Suthep on Huay Kaeow Road. The arboretum is on the left after the front entrance to Chiang Mai University and just before the entrance to the Zoo. The car park of the arboretum is at the end of the park near the zoo. See the maps below (click to enlarge them). Money for transport: THB 200 for downhill songthaew if you are choosing Variation 1; THB 50 to offer your driver if you are sharing a car to and from to Wat Doi Suthep, THB 40 one-way for songthaew to/from Wat Doi Suthep. Something warm to wear in case it is cold at the top of Doi Pui. Hi 🙂 Is this a very difficult hike? I’m in my 20s and hike moderately, I’m just not sure if you guys are super athletes, I would hate to slow people down. Hello Sonja. If you do Option 1, it is not very difficult: only about 10km, and accommodating of people who want to take it at a gentle pace.